Celebrating the power of bouncing back ~ and moving forward! On April 19, 2018, P4P presented our second annual live event, ART OF RESILIENCE, featuring five diverse presentations, by the individuals below, sharing their unique perspectives and experiences related to the theme of resilience. This very special evening took place in Toronto at Crowsnest Theatre, and was also webcast live for over 100 P4P partners, families and communities across and beyond Ontario. 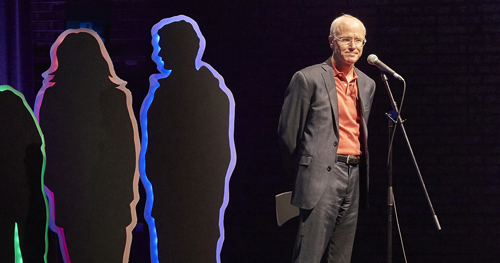 Event host Ted Kuntz (below) connected with each of our remarkable speakers to bring to life their unique messages about the power of resilience. 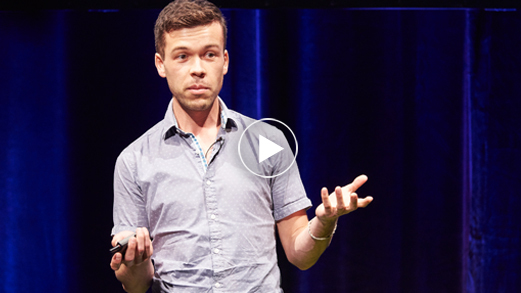 Ted is an author, psychotherapist, activist and father. Much of Ted’s wisdom arose from parenting his son Joshua, who taught Ted how to take advantage of the many gifts and opportunities life offers. 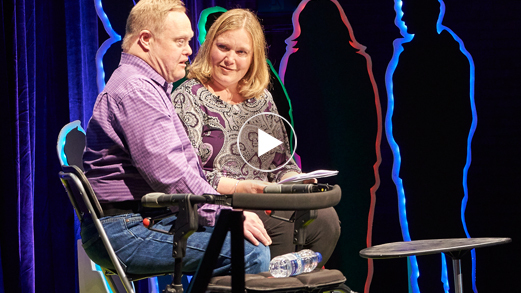 When their parents passed away, the life Helen and her brother Paul once knew changed suddenly. Through trials and tribulations, honest self-reflection, and a deep commitment to one another, Helen and Paul found a way to support each other. Paul is recently retired from the Government of Canada; Helen is a consultant, co-leader of a national siblings movement, and is a strong advocate for and has successfully impacted policy change in Ontario. Helen’s website is www.helenries.ca To join or learn more about the national sibling movement, email info@siblingcollaborative.org. Janice Bartley is an inspirational woman whose vocabulary doesn’t included the words “No” or “Can’t”. When Janice saw her siblings leave home and create lives of their own, Janice decided she too wanted a life of her own. With humour, persistence and an ever-present smile, she found her way. 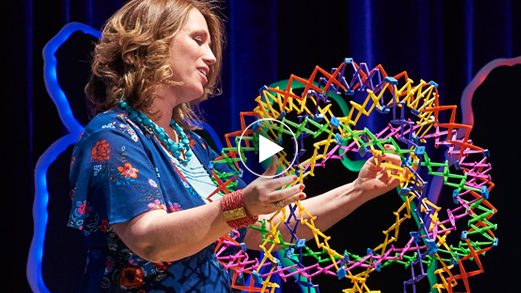 Janice shares her journey to create a life of joy, friendship, and purpose. 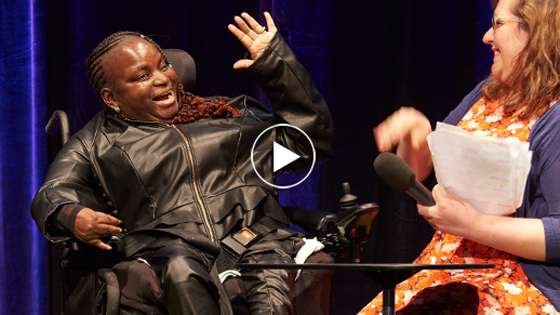 Janice is a graduate of the The MothSHOP Community Education Program and a speaker for the Self-Advocacy Association of New York State. 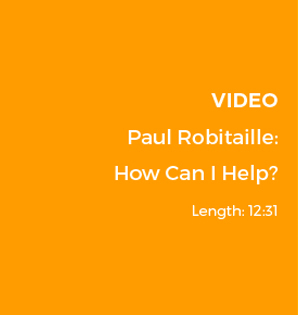 Paul Robitaille | How Can I Help? Paul Robitaille was trained in the natural sciences. However, after experiencing the transformative power of the Métis community, Paul re-directed his energies toward examining how communities can transform individuals, and individuals can transform communities. The wisdom Paul acquired from nature is that we all co-exist and impact one another. Paul is a member of the Métis Nation of Ontario, and has a profound belief in the power of community building - a belief fueled by his experiences working with Métis, Inuit and First Nation Youth from across Canada. When Jerome Bouvier crashed into rocks while water skiing, his life changed forever. 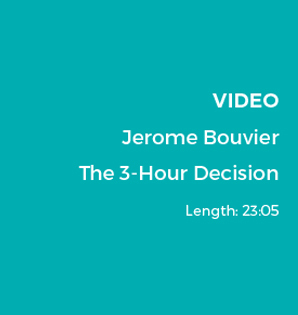 A severed spinal cord forced Jerome to make a decision. 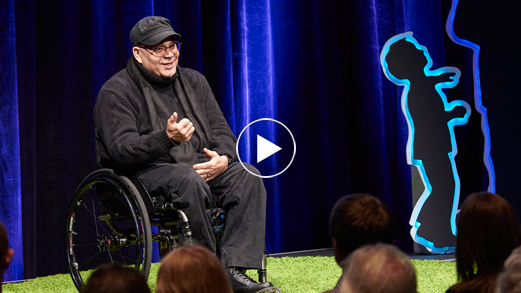 With determination, reflection and gratitude, Jerome transformed his accident into a gift that has guided him to realizing the power of the human spirit. Jerome is executive director of an award-winning not-for-profit ACCESS Youth Outreach Services, author, activist, public speaker, facilitator, race horse trainer and husband. Jerome’s website is www.jeromeinspires.com. Our presence is the fundamental gift that we bring to the human community. Presence is the foundation of all other opportunities and interactions, of everything that is meaningful. Register for P4P News for updates on new P4P Planning Network resources, including free webcasts on a variety of relevant topics followed by live expert Q&A.